Doctor Who: Remembering THE KING'S DEMONS | Warped Factor - Words in the Key of Geek. Tony Fyler plays around with some medieval misfits. They say you can’t have your cake and eat it too. They’ve clearly never seen The King’s Demons. Half historical, half alien shenanigans mostly for the fun of it, it shares more than a cupful of DNA with genuine classic The Time Warrior, but The King’s Demons is generally – if a little unfairly – less well-regarded. Arriving in 1215 the Tardis crew are welcomed warmly by Bad King John – welcomed as his ‘demons’ no less, seeming to confirm the rumours put about by a lot of cantankerous monks (Doctor Who Rule #612 – Never trust a monk), that King John and all his equally proud, quarrelsome brothers were cursed Hellspawn, a plague of kings and nobles let loose on England and the world. If King John welcomes demons to his side, then what hope for England? What hope indeed, given that it takes the Doctor much of the first episode to realise what it is exactly that’s been bugging him since they arrived. They’re in FitzWilliam Castle, some four hours by horse away from London – where the king absolutely has to be to take the crusader’s oath on March 4th, 1215. Today. So begins Doctor Who’s very own Game of Thrones, surrounding the question of who the imposter king really is, and why he’s going so very far out of his way to annoy the bejeesus out of the nobles in a castle four hours from London, while the real king is busy taking the oath in the city. It’s a game that is never really adequately explained – when the Doctor pushes some metaphorical buttons and ends up in a duel with the King’s Champion it becomes clear that the planning is being done by the Master, and it doesn’t take a genius to work out that if you’re pratting about with King John in 1215, you’re probably out to scupper the signing of Magna Carta and the laying of the foundation stone of eventual parliamentary democracy, but when the Doctor and the Master finally get to have a cosy tete-a-tete about the whole thing, there’s every chance the fine details go above the heads of many viewers. Essentially, ‘robbing the world of Magna Carta’ just about covers it, so long as you get into the spirit of the thing and don’t look too hard at a history book. We get the idea that this is the Master trying out his latest toy for size and capability, before moving on to bigger, more challenging things, so essentially, like the Meddling Monk not long before him, he’s just having a bit of a laugh. That’s certainly the prevailing mood once the Master is revealed – it’s the Master having enormous fun, bamboozling primitives, ‘stirring up the red ants and the black ants,’ shooting people, taking people prisoner, and generally seeing whether his imposter king is good for much more than an escape from Xeraphas. 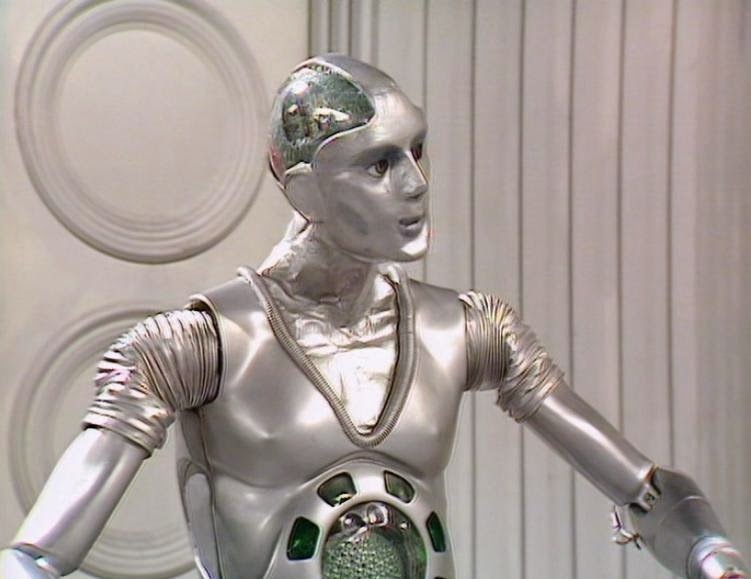 Ah yes, the imposter king – that would be Kamelion, a ‘complex mass of artificial neurons,’ capable of infinite form or personality and with a degree of autonomy which is crucial – if you’re going to build a robot that can impersonate important people as a weapon of infiltration, any strictly mechanical version is going to ultimately be a let-down if you let it loose with people who have known the real person it’s pretending to be. But with a degree of personality, your toy can ad-lib as necessary, and ensure the success of your plans. The real thing of course…looked good sitting down. If you tried to stand it up, it fell over and refused to work. It became almost immediately, expensively clear that if even George Lucas had relied on actors in costumes to play R2-D2 and C-3PO, Doctor Who would not be stealing a march on him any time soon. It would have been so much easier and more cost effective to re-shoot with an actor in a costume, and then Kamelion could have had a real companion life, rather than being ignominiously shoved in a cupboard and only mentioned again when it was time for him to come out and die in Planet of Fire. As it was, he looked good sitting down, and then quickly turned into other people, who could at least move about without wasting half a day in setting up the shot. For all its mystifying elements though – the exact nature of the Master’s plan, the lost potential of Kamelion, the ‘whence and hence’ dialogue that adds a stylized (if timeless) feel to the whole thing, the fact that the Master is accepted as a servant of the King in his fight against his demons, despite being witnessed emerging from the ‘body’ of Sir Gilles and carried off into a disappearing iron maiden – there’s a tremendous sense of gusto to The King’s Demons that means it’s still an enjoyable hour’sworth of Who, and it’s convincingly arguable that it’s the best piece of Who Terence Dudley ever touched in any capacity (the contenders aren’t strong – Meglos, Four To Doomsday, Black Orchid…). Certainly in episode two, the Master is a delight – far too often in 80s Who he was played with too much seriousness, using his mesmerism or his towering rage to impose his will. Here, and in the story that followed, The Five Doctors, he’s at his most natural and light, feeling at home in his skin, persuading, cajoling, being everybody’s friend, rather than everybody’s enemy. It’s in these two stories that Ainley’s Master most closely approaches Delgado’s ease and charm in the role. 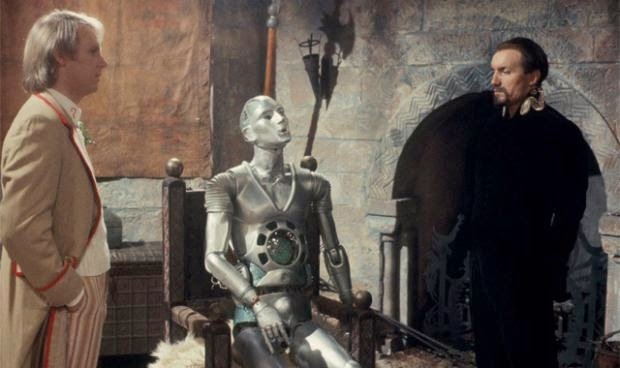 Davison too looks at home in the role here, able to show some Doctorly disdain but also playing within the scope of the story and the environment, forcing the hand of the Master and his toy king. Again the playground dynamic comes in, with the second episode belonging mostly to the Master, outstripping the Doctor in a lot of ways, and only losing ultimately because the actions of a companion help the Doctor find an additional burst of focus that the Master can’t match. 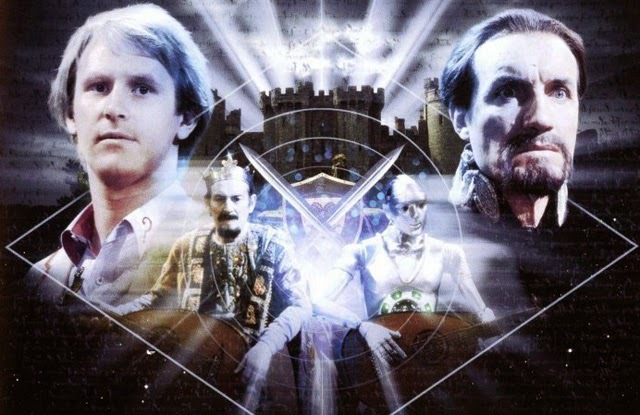 So for Ainley on top form, for a delicious short bust of historical malarkey, for Davison and a strong supporting cast and not least for a light frothiness that came as the most welcome relief after the unfathomable tedium of the Black Guardian trilogy (so much Terminus, so much beige, so few bullets), The King’s Demons is worth a watch even today.